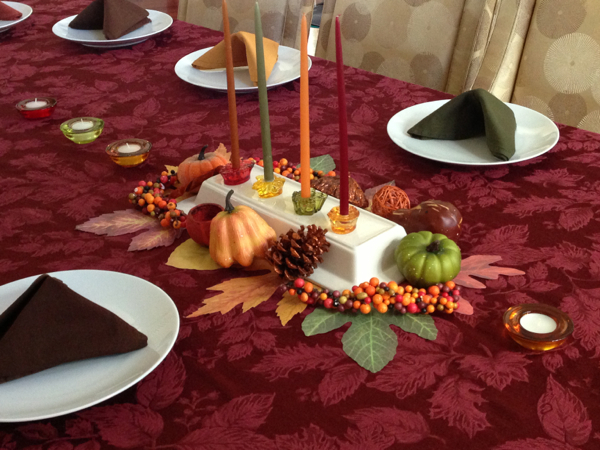 The table was set, the turkey was perfect, the stuffing, appetizers, and side dishes were all mouthwatering but to no surprise, it was the dessert that stole the show. 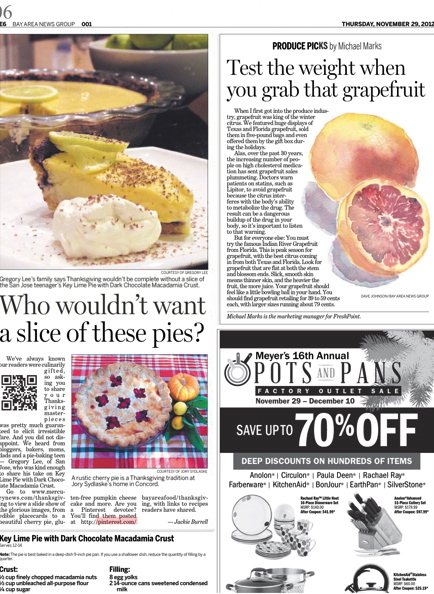 We had chocolate pecan pie, two home-baked pumpkin pies prepared by the kids, and the now famous key lime pie – which just last Thursday was featured in our local newspaper, The San Jose Mercury News, in the food section with kudos to my budding baker boy – @gregorytlee. So after taunting you last May with the recipe for key lime bars with pistachio crust, here, finally, is the now famous key lime pie recipe, just in time for you to add it to your holiday season dessert repertoire. Though @gregorytlee received full credit in the paper since he prepared the pie all by himself this year, the evolution was more of a father/son effort. 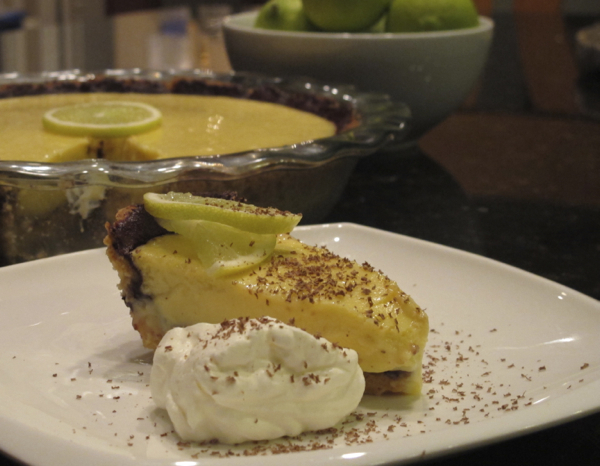 @dormantchef decided a few years ago that he wanted key lime pie. They found a recipe on Allrecipes.com for a macadamia-crusted white chocolate version. Being the chocoholics we are in this house, @dormantchef’s first modification was to change to dark chocolate. 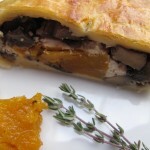 It provides a lovely color and flavor contrast to the tangy filling and crunchy crust. Each year, they worked on the pie together until @gregorytlee’s confidence grew and since last year, he has taken the reigns on this unusual but outrageously yummy Thanksgiving tradition. You can find the newspaper story by Jackie Burrell online – the photo of the pie is #7 in the series. 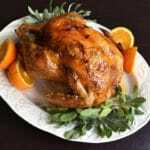 Here are a few step-by-step photos and the recipe as the boys adapted it from the original on AllRecipes.com. 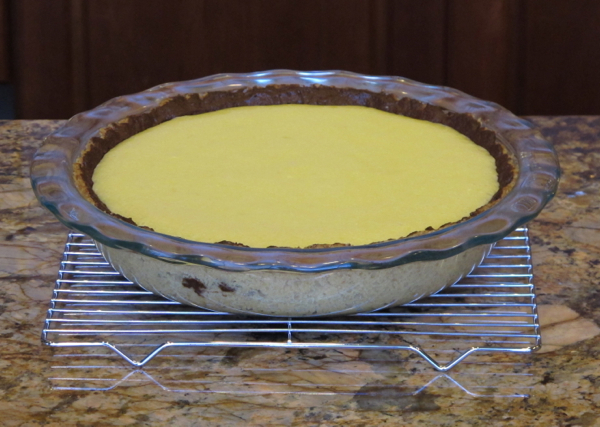 The partially filled lined crust – isn’t it pretty? This tangy pie recipe originated with a white chocolate lining. We substituted dark chocolate for the white, adding some contrasting flavor and color. 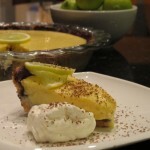 We’ve also made the pie with both traditional key limes as well as the lemony-looking limes that grow in our backyard. The regular size backyard limes result in a wonderful pie with far less labor than squeezing so many mini key limes. We use a deep dish 9” glass pie dish. If you use a shallower dish, reduce the quantity of filling by 25%. You can keep the crust constant and have a bit extra or use it all, resulting in a slightly thicker crust. We found the ratio of crust to filling as shown below to work just perfectly in a deep dish pan. 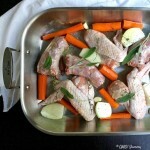 This recipe lends itself well to preparing it in stages, even over a couple of days if your time is limited. In a large or mini food processor, process the nuts, flour, and sugar until starting to combine, then add the cold, cubed butter and continue to process until it forms large crumbs but does not ball up. 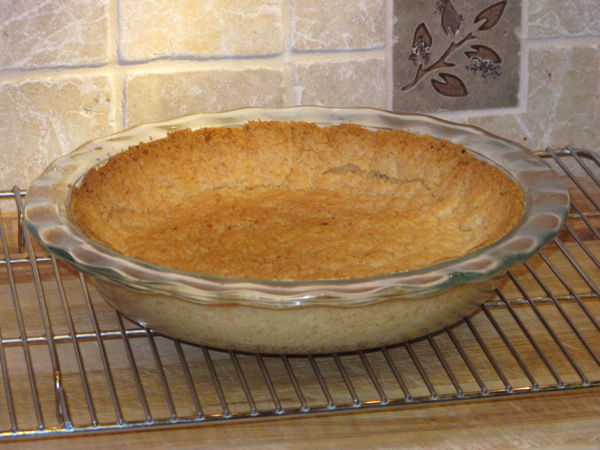 Press the mixture into the bottom and up the sides of a 9-inch deep dish pie pan, preferably glass. Freeze the crust until it is firm, 15 – 30 minutes. While the crust is firming up, preheat the oven to 350 degrees F. Once firm, bake the crust for about 20 – 25 minutes, until it is lightly brown and set up. Let it cool on a wire rack. If you are planning to continue preparation, leave the oven on at 350 degrees. 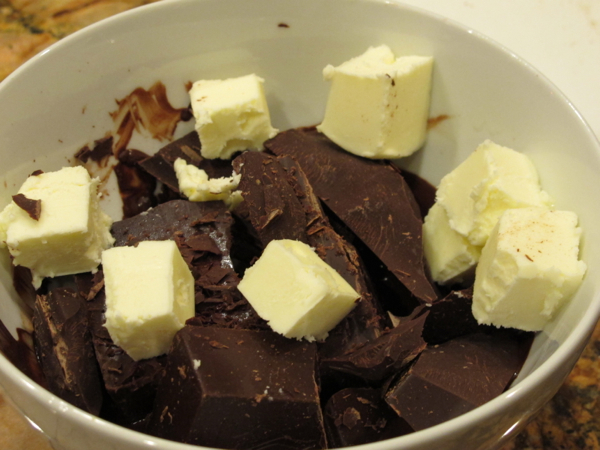 Combine the butter and chocolate in a small microwave-safe bowl. You can either place the bowl over simmering water and stir constantly until the chocolate and butter are melted, combined, and smooth or microwave it on your melt function or about medium power mixing frequently to be sure it combines, using 30-second bursts if you’re not sure how powerful your microwave is. 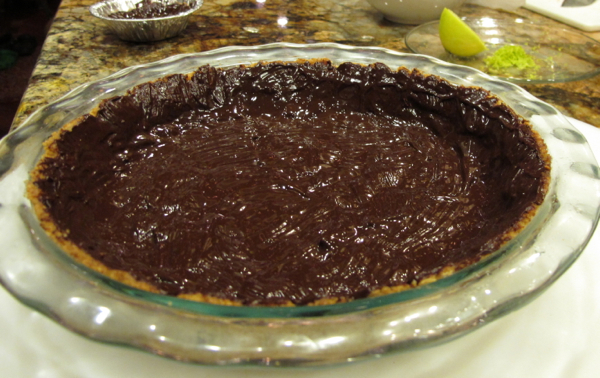 Once the chocolate is smooth and melted, pour it all over the crust and use the back of a spoon to spread it evenly all over the cooled crust. Freeze again until firm – even overnight if you are continuing the baking the next day. 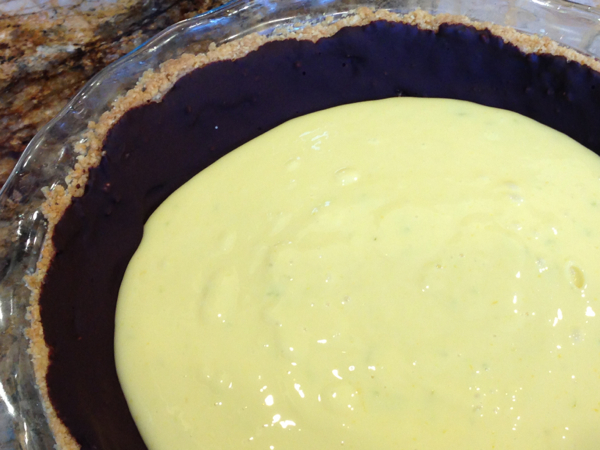 While the crust is chilling, in a medium bowl whisk together the egg yolks, condensed milk, and lime zest. Gradually stir in the lime juice until well combined. Pour the mixture into the chilled crust. If the pie pan has just come out of the freezer and was in there for a long time, let the glass pie dish warm up a bit before you place it in the hot oven. Bake the pie at 350 degrees for 20 minutes to set the filling. Remove pie and let it cool on a wire rack. Then cover carefully and chill for at least a couple of hours or overnight. While the pie is chilling, make the whipped topping by beating the cream and sugar (and optional zest and vanilla) to stiff peaks. Place a dollop of the whipped cream on each slice of pie when you serve it. You can decorate with shaved chocolate, lime slices, and/or zest if you like. I am absolutely LOVING that crust with the chocolate lining. Holy cow, soooooo good. This pie is definitely going to be making a regular appearance at our table. 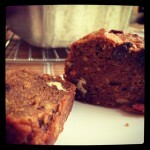 The taste is addicting – crunchy, creamy, citrusy, chocolatey – yum! 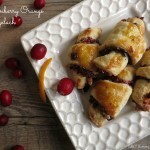 Wow, what a delicious and refreshing addition to a holiday dessert spread! I love that it’s different from the norm! Yes and now everyone wants this more than the traditional pumpkin pie! The Early 1970’S. Together The Loving Couple Own The Key Lime Pie Factory and Grille Near The Biltmore Estate In Asheville, N.C….It’s Just To Hard To Beat The Original. “AH,” The Magic of Anita Pelaez and Her Key Lime Pies! Hoping Gregory will bake another one soon and save some for papa and me. I love this pie! The addition of dark chocolate is marvelous and the pie looks beautiful. I can see why this is a family favorite. Congrats to your son on the newspaper feature, too – he has a bright baking future! Good thinking! Have fun – I’m sure the rugelach will be terrific. What a fun post and that pie looks divine! Congrats to your @gregorytlee! 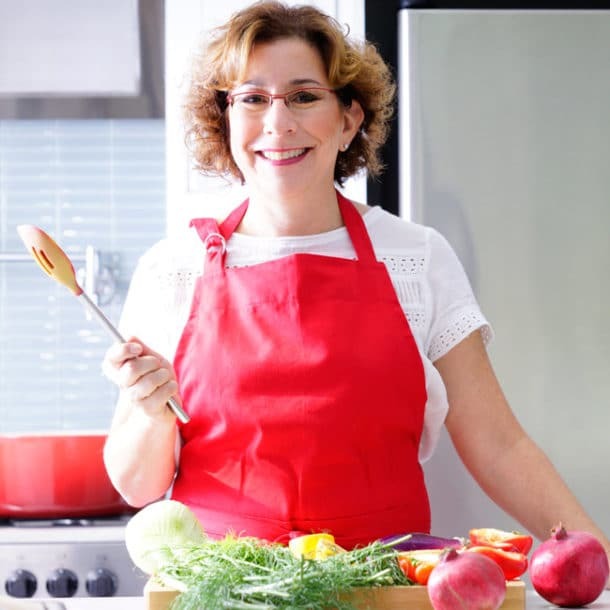 Thanks Carol – I sent your congratulations to my budding baker!